This compilation is almost as bizarre as the misleading liner notes. Some of these excerpts/edits are shamefully short (sorry Steve Reich and Lasry-Baschet), but where else are you going to get Harry Partch or Conlon Nancarrow on 7"? Think of it as an educational tool. Or, for you more cynical and privileged: simply an artifact. Over Thirty? Stuck in the same musical bag for too long and getting a little twitchy? Have you run through the three Bs and back to Monteverdi and forward to Mahler and Ives? Are you bored with Perry Como but not desperate enough to want to embrace "The Stones" or Janis Joplin? Peace. Under thirty? Are you getting bored occasionally with Jimi Hendrix, maybe a little put off by Jim Morrison? Jaws tired of "bubble gum music"? Want to broaden your horizons without getting trapped in that square symphony and opera stuff? Good news! There's an area of new music growing that you can listen to without your friends accusing you of selling out to the other side. We don't know what to call it yet and we probably won't until strict "pop" and "classical" and "jazz" categories are ground into dust by the electronic age. But just because we don't have a name for it is no reason you can't go ahead and enjoy it. Its borders are hazy and loose. 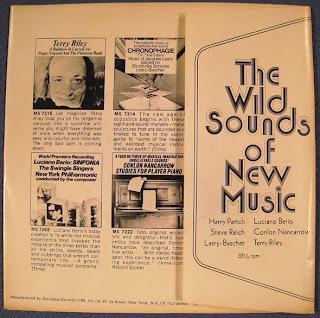 Some of it is being written now by people like Terry Riley and Mort Subotnick and Luciano Berio. Some of it a decade or two old, is just now being discovered: like Blood, Sweat, and Tears uncovering Erik Satie or kids grooving to the sound of Harry Partch or Varèse. So, if you've got the musical "blahs," listen. There's enough on this record to keep your adrenalin pumping through 1970. Come on, get with it!